Since 1992, Drumtek has provided the best private Drum Kit and Percussion tuition to Drummers from all around Australia. Lessons are available in all styles and techniques and open to students of all ages and skill levels. Our private lessons are conducted from Monday to Thursday and all day Saturday in Drumtek's state of the art teaching studios (right above the shop). Whether drumming is your passion, career, therapy or just your favourite hobby, we can help you take your playing to the next level. 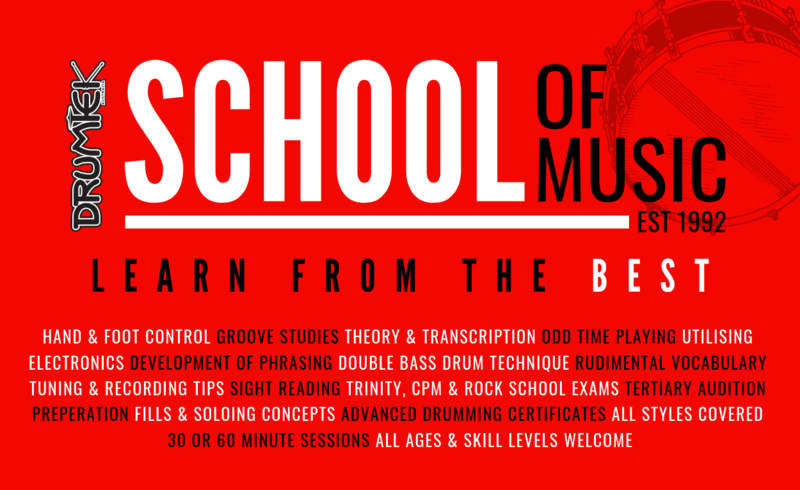 All School of Music Students are invited to join our members only Student Facebook Group where they can interact, post, share and comment on all things Drumtek, Drum and Education related! Any news and announcements related to the School can be found there. Many other titles, as well as any further Drumming supplies are available in-store, or Online.